Advice on teaching the two-digit numbers, including the handling of teen numbers. Teacher notes: teaching with ten frames to 20. Why they are important, teaching tips and classroom activites and ideas. Teacher notes: using double ten frames for recognition of numbers to 20, addtion, subtraction, and multiplication facts. Teacher notes: How are manipulatives (concrete materials) different from one another in teaching the tens and ones place, what the benefits are of each and how they are used. 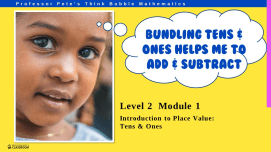 Teacher notes: Introducing place value with tens and ones, with activities, questions and classroom ideas; how to develop the concept and what to use. Includes template for T O chart. Large images of base ten blocks suitable for board use. Just print, laminate and glue adhesive to the back. Recognition & writing of numbers to 20 using double ten frames. Combined pages introducing teen numbers with ten Frames. 5pp. Reading and writing the number names in words for numbers 11 to 19. 7pp. Ideas for classroom and small group activities with number lines. Includes multiple number line templates for printing class sets. 9 pp. Position numbers on number lines. Find the missing numbers and match with ten frames worksheets. Includes 2 templates. 11pp. Use the Number Popup Gadget to understand and write expanded notation for numbers to 99 and 999. Includes lesson plans and worksheets.